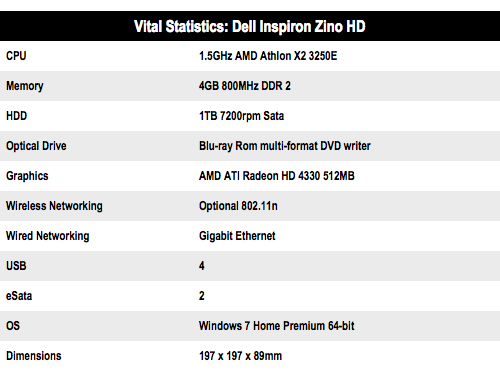 Review The price of the Dell Inspiron Zino HD has risen since Reg Hardware first reviewed it, with the base price now starting at £329 instead of £279. The highly specced review system came complete with a Blu-ray combo drive and we calculate the all-in price at £730. You don’t get a TFT display included in that price but you should have no trouble finding a location near your telly as the Dell is tiny, measuring 197mm square and 89mm tall. It also has an HDMI output. Other ports and connectors consist of four USB 2.0 ports, an SD card slot, Gigabit Ethernet and 802.11n wireless, headphone jacks and not one but two eSata ports. It’s a strange collection of connectors – two eSata ports? – and the lack of surround sound detracts from the appeal of the AMD ATI Radeon HD 4330 graphics, the optional Blu-ray drive and the copy of PowerDVD Blu-ray software. After all, Blu-ray movies typically have 5.1 or 7.1 soundtrack. 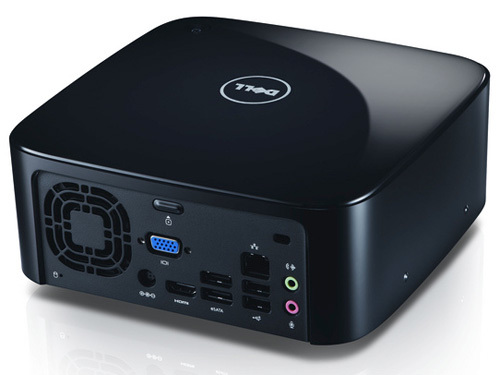 Despite the small footprint of the Zino HD, Dell has squeezed in a full-size, 3.5in desktop hard drive that provides a massive 1TB of storage. The dual-core AMD Athlon X2 3250E processor and relatively weedy graphics mean that while you can happily watch movies, mainly thanks to the ATI movie decoder, you can pretty much forget about playing games at Full HD settings with the Dell. You’ll be able to play less intensive games such as Far Cry 2 at 720p provided you ease back on the quality settings. A pricey but very nice looking mini PC with a decent media machine specification.